Americans have a love/hate relationship with old things. We have an addiction with all that is new, cutting edge, state of the art, or any of the other quaint terms that manufacturers attach to their products to make us salivate with desire. However, we also covet those things that are old, especially if they can be termed 'antique' or have some collectable value. Retro is in; from clothing styles to bicycles, that which is old has a way of becoming new again, and alas, as Shakespeare said, there is the rub. We covet old things as long as they are trendy, collectible, and possibly valuable. Fly-fishers, as a group, are among the most addicted to the latest and greatest innovations that flow from the inventive minds of the producers of fly-fishing paraphernalia. From fly rods to fly dubbing we eagerly gobble up the latest new and improve version of any product that promises to make us a better _________ [you insert the proper word – caster, fly tyer, celebrity, guru] One only needs to pick up the latest fly-fishing magazine, or open the pages of the newest fly-fishing catalogue to be reminded that all the latest gadgets that we purchased last week are now passé. This is especially true of the more expensive items in our sport, rods and reels. Having observed the sport of fly-fishing for several decades now I am constantly amazed at the hype that attends every new fly rod that routinely appears on the market, and how this latest new technology makes everything that came before it obsolete. I have a considerable stable of fly rods ranging from bamboo to graphite. 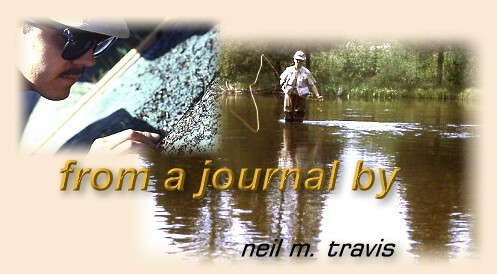 Most of my fly rods are over 20 years old, and several of them are pushing 40. Whenever I get a chance I will pick up one of the latest rods and see if they make me a better caster. To date I have not found a single rod that would allow me to cast any better, farther, faster, or more accurately than any of my older rods. Many years ago Castwell and myself taught fly-fishing seminars. In the late winter we would secure the use of a local gymnasium on a Saturday morning, and we would draw in a crowd of local anglers that were anxious to enhance their fly-fishing skills. These one-day events entailed, among other things, demonstrations in knot tying, basic entomology for anglers, and casting. Castwell had a kitchen broom that he had turned into a fly rod of sorts complete with guides and a reel seat. He would start out our casting demonstration by using this broom rod to illustrate the fact that you can cast a fly line with just about anything. He became pretty good with that broom, and with correct timing and a couple of tugs at the right time he could cast nearly an entire fly line, much to the amazement of the assembled multitude. Laying aside the broom he would then pick up a standard fly rod and begin to demonstrate several types of casts. When the demonstration portion of our program was over we would work with individual anglers. We encouraged anglers to bring their own fly rods with them so that they could use them rather than one of our demonstration rods. First we would let them cast while we watched. Remember this was 40 years ago, and few anglers had ever taken a casting lesson, read a book on casting, and no one had ever seen a casting video. Most of the casters were atrocious, with tailing loops, whip cracking back casts, flailing arms, and snapping wrists. In those years we saw every casting style imaginable. Those were truly the days of chuck and chance it. Once they had succeeded in breaking every rule of fly-casting mechanics we would take their rod and proceed to show them that even with their equipment it was possible to make a decent cast. Admittedly many of the rods we handled were more suited for poking bats out of chimneys than fly-casting, but the point was that technique was more important than equipment. Even the worst fly rod was better than Castwell's broom, but by using the proper technique even a broom can serve as a tool for casting a fly line. Then, as now, everyone wanted to make long casts. At any fly-casting demonstration it is the distance casting that draws most of the interest. Everyone wants to double haul the entire fly line, although most anglers, unless they are fishing in the salt or fishing for salmon or steelhead, rarely need to be able to double haul, and in many cases it is a determent rather than asset. Rod manufacturers and retail sellers capitalize on this lust for greater and greater distance by advertising that their latest rod will easily add several feet to the anglers cast. If every new and improved fly rod that was sold in the last few years added several feet of casting distance we would need 200-foot long fly lines today! Last summer I attended a fly-casting demonstration by my old friend Gary Borger. During the demonstration he illustrated several different casts; curve casts, roll casts, change of direction casts, side arm casts, puddle casts, and several other casts for specialized circumstances. Nearing the end of his demonstration he stripped off the entire fly line, and with a couple quick hauls shot the entire line out over the crowd. What made this demonstration especially meaningful to me, and what few in the crowd knew was that this entire demonstration had been conducted with just the tip of a fly rod. Gary had taken a reel and taped it to the ferrule end of a broken fly rod tip, and that is what he used for the entire demonstration.